Thermohydrodynamic Programming and Constructal Design in Microsystems explains the direction of a morphing system configuration that is illustrated by life evolution in nature. This is sometimes referred to as the fourth law of thermodynamics, and was first applied in thermofluidic engineering, with more recent applications in physics and biology. The book specifically focuses on synthetic modeling and constructal optimization in the design of microsystemic devices, which are of particular interest to researchers and practitioners in the sphere of micro- and nanoscale physics, a mechanistically deviation from conventional theory. 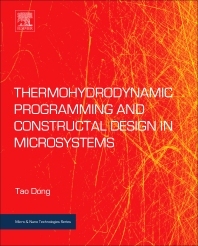 The book is an important reference resource for researchers working in the area of micro- and nanosystems technology and those who want to learn more about how thermodynamics can be effectively applied at the micro level. Ph.D. Tao Dong is a full Professor and Primary Supervisor for Ph.D. candidates with Department of Microsystems, Faculty of Technology, Natural Sciences and Maritime Sciences, University of South-Eastern Norway. He is also the honorary Chair Professor II at Chongqing Technology and Business University, China, as being selected in “6th Chongqing Municipality 100 Overseas Talent Gathering Plan (Hundred Talents Program)”. Professor Tao Dong received the Ph.D. degree in mechanical engineering and the Postdoctoral Diploma from Nanjing University of Science and Technology, Nanjing, China, in 2003 and 2005, respectively. Ph.D. Tao Dong has published over 150 international peer-reviewed academic articles and 14 patents so far. He has supervised 15 Ph.D. and post-doc candidates, and 45 master students in Norway and China. His research interests include heat mass transfer in micro- and nano-systems, microfluidics, BioMEMS and so forth.